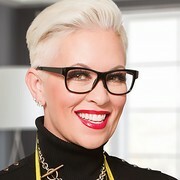 Designer Kelli Ellis just put the finishing touches on Kandee Johnson’s bedroom and makeup studio makeover, and now she’s ready to unveil the results. In part one of a two-part reveal, an anxious Kandee Johnson arrives home for a first glimpse at her new makeup and film studio, now deemed the “Kandee Shop.” Will she fall madly in love with this revamped space? Watch now to see her reaction!